Burnley-born goalkeeper Marcus Burgess is determined to put himself in the shop window after being selected for the English Universities squad for a second time. The 21-year-old, in the final year of a Sports Marketing and Management degree at Manchester Metropolitan, firmly believes that he’s one of the best unsigned keepers in the education system and he’s ready to go out and prove it. 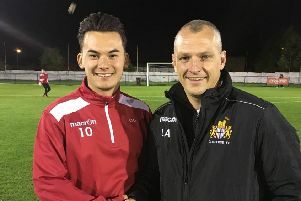 The Storks stopper, on loan at the Ruby Civil Arena from Evo-Stik First Division North play-off contenders Prescot Cables until the end of the campaign, received the call up after impressing in the regional trials. After losing 3-2 in the opening fixture, Burgess was introduced in the second leg of the North against South Challenge Cup and kept a clean sheet as they went on to win 6-3 on aggregate. The cream of the crop will now take on the Scottish Universities side in Northumbria on Wednesday before taking on Manchester United’s under 23s at the Carrington Training Complex on May 14th. “It’s a massive achievement for me to be called up again,” said Burgess, who dovetails his studies with captaining the MMU Sport men’s football team. “It’s been a difficult season with injuries, suffering a medial ligament tear at the end of October, but this is a huge confidence boost. “It will be a really good experience. It doesn’t matter what level you represent your country at, it’s always an honour. As a teenager, following his release from Turf Moor, Burgess was facing four-time African Player of the Year winner Samuel Eto’o and Belgium international striker Romelu Lukaku during a trial with Everton at the club’s Finch Farm training facility. Invitations to Bolton Wanderers and Fleetwood Town followed, while studying at UCLAN in Burnley, but nothing came of either opportunity. “I was in one-on-one situations with Samuel Eto’o and Romelu Lukaku,” he said. “Eto’o has won the Champions League and he was African Player of the Year. I was amazed by their presence. It was incredible. “It’s mental to see where Lukaku is now. I’ll remember that moment for the rest of my life. I trained with all the Everton first team, it was a massive honour and something nobody can take away from me. Should Burgess continue to impress at this level, the Clarets fan should retain his spot in the English Universities National Squad for the Home Nations tournament in 12 months time. That could provide him with the chance to catch somebody’s eye and engineer his climb up the ladder. Burgess said: “Hopefully these fixtures will put me in good stead to be selected for that squad. We missed out on goal difference last time so hopefully we can get the job done. We’ve got a good chance of winning it. “I want to play against the best players possible. I’ve got aspirations to play as high in the pyramid as possible. “I just need to put in the performances that put me in the shop window and then I can climb up the ladder. If people come to watch then it increases the chances of that happening. He added: “There are plenty of professional clubs in the Conference North and South as well and that’s the environment that I want to be in. I just need that opportunity but I’m confident I’d take it if it came. “I’m one of the best unsigned goalkeepers in the education system. It’s a massive honour that I’ve been able to represent my nation at such a young age. It’s something that I can look back on with pride. “Singing the national anthem and pulling on the shirt isn’t something that you get to do every day.